BULLS GAP, TN – June 3, 2018 – Jimmy Owens of Newport, TN collected his second World of Outlaws Craftsman® Late Model Series win of the 2018 season after a thrilling feature event at Volunteer Speedway. Owens and Chris Madden battled for the lead for the majority of the race until Owens successfully completed the pass on lap 47 of the 50-lap Sears Craftsman Feature. The Newport Nightmare’s victory brought the crowd to its feet in jubilation. Madden commanded the lead from pole-sitter Michael Chilton on lap 13 and continued to hold off a close battle within the top-five between Owens, McDowell, Chilton, and Sheppard. The 50-lap event had zero cautions which made it difficult for the race leader to pull away from the pack. With only three laps remaining, Owens pulled the trigger and slid by Madden for the lead. 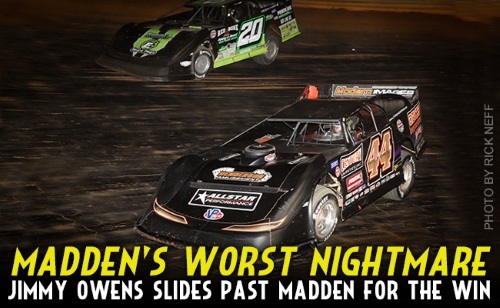 Unfortunately for Madden, who had led nearly three-fourths of the event, a lapped car kept him contained ultimately allowing Owens to pull away and claim the $10,000 payday in his home state. McDowell rounded out the podium during the World of Outlaws first return to Volunteer Speedway since 2008. 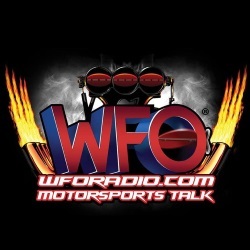 For full results from Volunteer Speedway, visit woolms.com or click here. 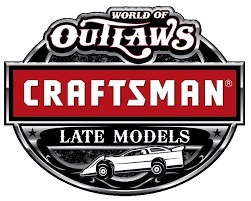 The World of Outlaws Craftsman® Late Model Series is brought to fans across the country by many important sponsors and partners, including: Arizona Sport Shirts (Official Apparel Company), Craftsman (Official Tool), Hoosier Racing Tire (Official Tire), iRacing (Official Online Racing Game), Morton Buildings (Official Building), NGK (Official Spark Plug), Sears (Official Home Store), TEXTRON Off Road (Official Side-by-Side Vehicle) ,VP Racing Fuels (Official Racing Fuel), DirtonDirt.com (Hard Charger Award) and PFC Brakes (Fast Time Award); in addition to contingency sponsors, including: Cometic Gasket, COMP Cams, Edelbrock, JE Pistons, , MSD, Penske Shocks, QA1, QuarterMaster, and Wrisco (Exclusive Racing Aluminum); along with manufacturer sponsors, including: Capital Race Cars, Integra Shocks, Impact Racing Products, Intercomp, Racing Electronics, Rocket Chassis and TNT Rescue.